The Board of Directors of Preservation Texas and Honor Awards Reception and Ceremony Co-Chairs Minnette Boesel and Margaret Wallace Brown invite you to attend a celebration of outstanding preservation achievements on Saturday, November 22, 2014. 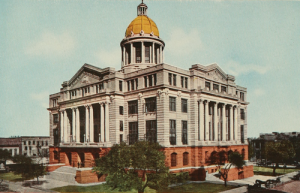 The event will take place at the award-winning, recently restored and rededicated 1910 Harris County Courthouse, located at 301 Fannin Street in central Houston. A Reception with beer, wine and light hors d’oeuvres will begin in the Rotunda at 5:00 pm with the Ceremony to begin at 6:00 pm in the 1st Circuit Court of Appeals Courtroom.